The 2ndMahendra Karki Memorial Invitational Football Tournament 2018 will be kicked off from April 19 here at Paljor Stadium. A total of 12 teams from different parts of Sikkim and outside will participate in the tournament, which is being organised by Sikkim Boys Football Club. The participating teams are SDFA, Namchi, Sikkim Police, Renzong FC, Sikkim Aakraman FC, Gangtok Himalayan Sporting Club, Boys Club Gangtok, United Sikkim FC, State Sports Academy and Kumar Sporting from Sikkim. Likewise, United Kurseong FC, Apex FC Kalimpong and United Brothers Kalimpong are also participating in the tournament. The inaugural match will be played between Sikkim Police and Renzong FC on April 19 at 1:30 pm. The tournament is scheduled to be inaugurated by the Buildings & Housing Minister DT Lepcha and Rajya Sabha MP Hishey Lachungpa will be the guest of honour. 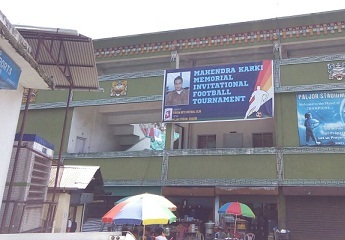 The tournament is organised annually by Sikkim Boys FC in memory of former Sikkimese footballer Late Mahendra Karki. A Gangtok resident, Mahendra Karki was killed in a car mishap at Gangtok in 2011 at an age of 31 years. He was a popular footballer and represented state team in regional and national tournaments. He was also a member of the state football team that reached the quarterfinal round of Santosh Trophy in New Delhi in 2004, the best performance of Sikkim till date. Members of Sikkim Boys football club, many of whom have played with Late Mahendra Karki at national football tournaments, are hosting the tournament as a tribute to their friend. Ophthalmologist Dr Karma Loday from Central Referral Hospital, Tadong will conduct a free eye check-up camp for the members of the participating teams on April 29. The final will be played on April 30 under floodlights at Paljor Stadium. The first edition of the tournament was held in May last year at Paljor Stadium with the participation of ten teams. Sikkim Aakraman FC is the defending champion of the tournament.